Since my son, Jensen, was stillborn last April, I’ve found myself living with a heart that has been hastily taped together. There have been so many moments I didn’t believe I would be able to make it to the next. My heart felt like it was going to collapse and it still does to this day. Lately, I’ve collectively felt what has been happening around the world. This could be you reading right now whose baby has tragically died. I know this journey you’re facing because I’m living it every second. This past few months I’ve seen so much loss. From the tragedy that happened in Manchester earlier this week to the person in school that doesn’t think their life is worth living. Even the people who are being mentally, emotionally, physically, and sexual abused. I feel like I’ve been extremely empathetic to every story I hear. I’m sorry to each person this has happened or is continuing to happen to. I see you. It breaks my heart that you’re feeling this pain. I will never be able to take your pain away, but if talking helps ease it, I’m right here. There have been times I’ve felt lost, but knowing there was someone who listened, that wanted to help strengthen my heart made me feel less afraid. Less fragile. It is terribly vulnerable to talk about your demons, but opening up and releasing those feelings can let someone know how to be there for you. Please don’t ever feel alone in this world. Here’s a little secret. To some, I’m a fellow loss mom or a substitute teacher or the girl down the street. In each of these roles, I’ve heard your story and feel everything that’s going on in your life. When I see you struggling with your relationship, loss, or even yourself, I want to run up and comfort you. The worst is or has happened and left you broken. Each time I see you I want you to know you can come to me because ultimately we have lost part of the same thing. Through each and every of our difficult unbearable journeys, we have lost a huge part of our innocence. Nothing will ever change or bring that back. We now see this fragile world for how it actually is: broken. The glue holding the world together is you and me and our relationships we build to strengthen each other. We’re able to help each other pick up the pieces. We are each others shoulder to cry on. when we are connected we become stronger. We fit in this beautifully, fragile community of survivors. You make an impact on this world. Remember, I’m always here for you. 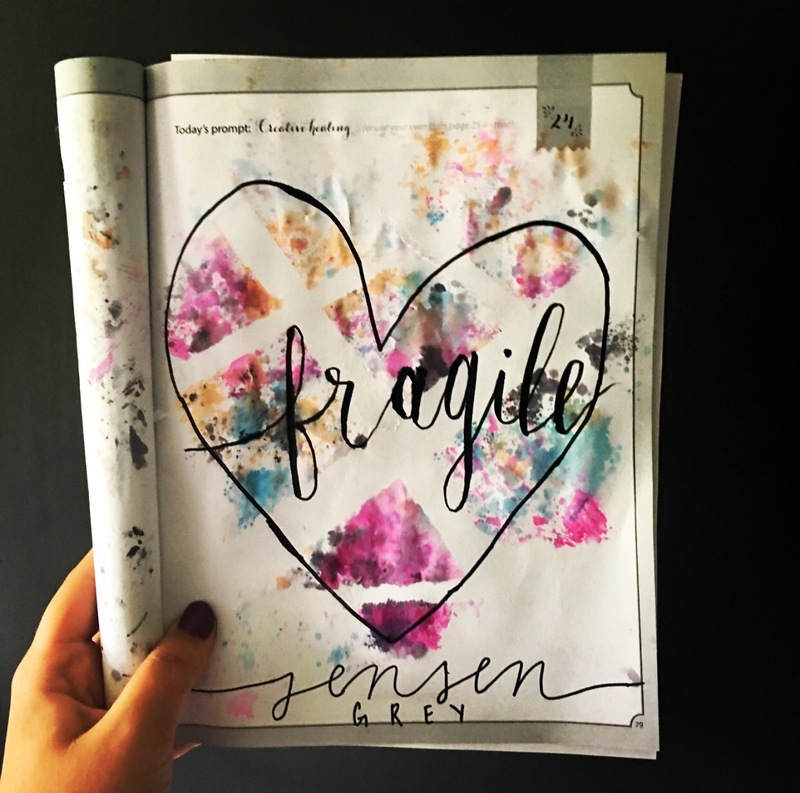 This entry was posted in grieving, Jensen, May We All Heal, stillbirth and tagged anxiety, baby loss, child loss, depression, Fragile, grief, grief attack, grief journey, grief work, grieving, infant loss, infant loss awareness, Jensen, Jensen Grey, letter, life, life after loss, loss, loss community, love, mama grief, May We All Heal, mental health, mental health awareness, MWAH2017, Pregnancy and Infant Loss, Pregnancy and Infant Loss Awareness, stillbirth, stillbirth awareness, stillborn, Stillborn Still Loved by danielleridgway. Bookmark the permalink. You are very brave and giving of a unselfish heart that mourns in a unbearable way. I’m sure many that has read about sweet Jensen, are touched, don’t feel alone, and can say i know what its like to have the presence of being a great mother, yet have to experience the unbearable pain of not touch and experience that presence of being what you know, A Loving Mother. I’m so sorry for your loss. i pray for you and pray you. Thank you for your sweet words and prayers. They mean the absolute word to me. I hope I’m able to help someone out through their journey. If I’m able to do that, I know Jensen will be proud and I am able to give back in a way so many brave, grieving mothers have helped me.